All of Medline's powder-free gloves have a proprietary inner polymer coating, which allows for easy donning and double gloving. 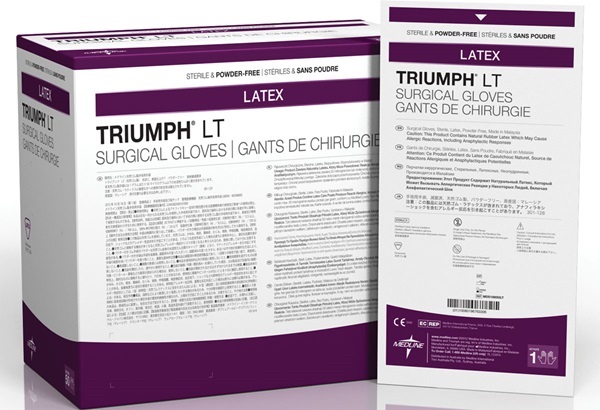 The Triumph LT Sterile Latex Powder-Free Surgical Glove is a standard-thickness glove that can be used alone or as an outer glove when double gloving over Medline's Aloetouch Latex-Free Powder-Free Surgical Glove. The unique beaded cuff is reinforced to resist tearing. 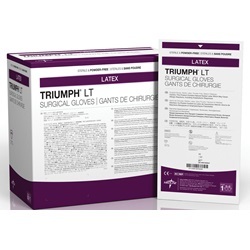 Sterile, white-colored gloves with a lightly textured surface coated with synthetic polymer donning agent. Each glove has beaded cuffs and is intended for single use. 12" in length with a 23mm fingertip thickness. Manufactured by Medline. Sold 50 pairs per box.